70 years ago, a species called the yellow crazy ant (Anoplolepis gracilipes) turned up at the Christmas Islands off Australia, perhaps stuck to a piece of timber. For a long time, it remained dormant. Then in the mid 1990s, its population began to explode. Yellow crazy ants began to form super colonies, some as grotesquely large as 700 hectares (ha). The species swarmed the island, colonising -- by 2003 -- 2000 ha of tropical forest. Literally chewing up all the litter and canopy fauna (spiders, insects, birds, mammals and reptiles), in the last five years the crazy yellow ant has also devoured 20 million red crabs. Now, Christmas Island's red crabs are a decimated species; the forest, robbed of all its pollinators, is going the way of dead wood. And the crazy ant is a mere metaphoric drop in the roiling ocean of biological invasions swamping countries. A biological invasion occurs when an animal or plant species expands into an area it hasn't previously occupied.Such invasions alter the ecosystem, usually for the worse. Invasive species — defined as those that produce fertile offspring in large numbers at a considerable distance from the ecosystem they originally belong to — are today the second biggest threat to biodiversity; after habitat destruction. While the movement of plants and animals across habitats and ecosystems is a natural process — ecosystems are inherently dynamic, losing some species, gaining others — it is the constantly accelerating rate of invasions that today looms menacingly over the world’s economy. Increased human movement, domestic and trans-national, has caused such acceleration. If many species are inadvertently carted off to new habitats, others are deliberately introduced, for profit or even vanity: US nursery catalogues, for example, offer nearly 60,000 plant varieties for sale, often to the global market via the Internet. A study conducted by David Pimentel and others at the College of Agriculture and Life Sciences, Cornell University, US shows that over 120,000 non-native species of plants, animals and microbes have invaded just six countries — the US, the UK, Australia, South Africa, India and Brazil. Extrapolating this figure, the study concludes that 480,000 alien species have been introduced into ecosystems the world over. While not all alien invasives are harmful — only think of rice or wheat — the study calculates such species today cause more than US $314 billion worth of damage every year (see table: The alien invasive bill). It is an approximate cost, for it is impossible to quantify, or substantiate, damage by invasives. This is also because only some 1.5 million species of the estimated 14-45 million species on earth have been identified. What all has been lost? It is not known. The loss to agriculture and soil productivity is well known. According to A S Vastrad of the University of Agricultural Sciences, Dharwad, the serpentine leafminer (Liriomyza trifolii) — introduced into India during 1990-91 through imported chrysanthemum cuttings — feeds on several economically important crops: cucumber, snake gourd, bottle gourd, pumpkin, watermelon, beans, palak, gerbera and marigold. Then there is the spiralling whitefly, (Aleyrodicus disperses). A native of Central America that rapidly spread westward across the Pacific and southeast Asia, and entered India from Sri Lanka in 1994, it predates upon more than 150 species including fruit plants, vegetables, avenue trees and hedge plants. It has already wreaked havoc, Vastrad notes, on 72 plants belonging to 38 genera. The invasion of the coconut mite (Aceria guerroronis) causes damage worth Rs 200-250 crore annually in Kerala. Forests lined by lantana (Lantana camara), waterbodies taken over by the water hyacinth (Eichhornia crassipes), fallow lands colonised by the mile-a-minute weed (Mikania micrantha), even houses infested with rats…the list is endless, and knowledge of the impact of alien invasives is limited. Nevertheless, ecological scientists have begun to crack a hitherto puzzling question: what makes a species invasive in a new habitat? “Asuccessful invasion is a rare event,” says Suresh Babu, a researcher at the School of Environmental Studies, University of Delhi. An accepted thumbrule is that only one in 10 introduced species become naturalised, and only one in 10 among the latter actually turn invasive . 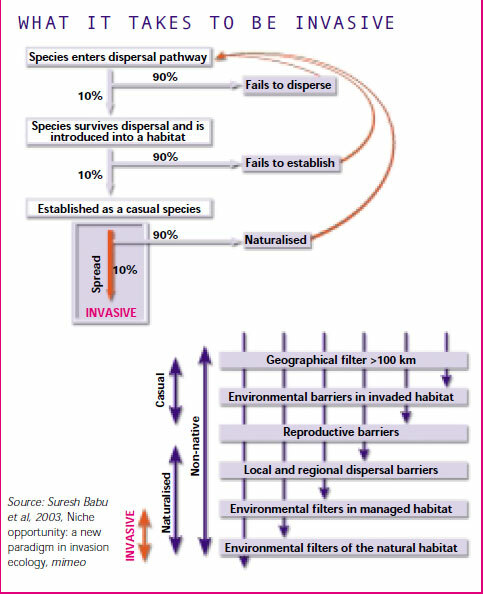 This is because, as Babu puts it, “A species arriving in a new community faces a series of filters.” (see flowchart: What it takes to be invasive) Invasion usually occurs in three stages. A species is first transported to a new habitat. It must then establish itself there: a base population must manage to successfully reproduce itself. Naturalised in this way, the species population explodes and so turns invasive. Even so, what makes for a successful invasion? Out of 250 species in the genus Mikania, how is Mikania micrantha capable of smothering new habitats? Imported and introduced, reportedly, in West Bengal in the early 20th century, it was initially used in Assam to cover airstrips during World War II. It then moved from there and now is the biggest threat to tea plantations, apart from badly affecting pineapple, banana, ginger, acacia and rubber plantations. How is it able to do so? For one, this mile-a-minute weed could possesses what scientists call phenotypic plasticity. As O R Reddy, joint director, plant pathology, plant protection quarantine, Union ministry of agriculture, explains, “It helps the invader to have resilience to environmental stress, the ability to adjust to different environmental conditions like prosipis juliflora displays. It shows wide range of spread across India.” Greater genetic variability also helps. As Babu outlines, a plant must have the following traits to become invasive:  It has long-lived seeds for discontinuous germination  It grows rapidly from vegetative to reproductive stage  It is capable of very high seed output when environmental conditions are favourable  It produces seed continuously throughout the growth period and in a range of environmental conditions  It is built to disperse seeds over short and long distances  It has a strong potential to compete with other species Ecological paradox Usually, if a species is present in small numbers, its breeding options are low. This genetic bottleneck might cause it to become extinct. But invasive species manage the bottleneck with flourish, and after establishment can explode in numbers. New research published in the journal Conservation Biology suggests a factor called propagule pressure might be crucial to “invasiveness”: the number of individuals introduced, and the number of times a population is released into the new habitat. But how is a species able to outperform locally adapted, indigenous species? R M Callaway, in a paper published in the journal Science, provides some answers. First, some species may be intrinsically better competitors because they evolved in a more competitive environment. Second, the absence of enemies — say, herbivores in the case of plants — gives the non-indigenous species more resources to grow, reproduce and eventually out-compete native species. In this context, the case of the Chinese tallow tree (Sapium sebiferum) is extremely interesting: as it evolved in its introduced range, it began to show competitive ability far greater than it exhibited in its original habitat. 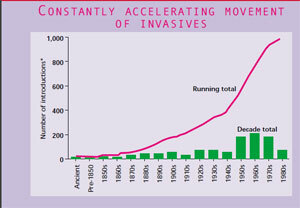 Indeed, invasive species can create and manage brilliant strategems to beat the competition. When a pathogen’s host is already there, as mosquitoes were for the West Nile virus, it can tip the odds in favour of the invader, says Daniel Simberloff, professor at the University of Pennsylvania, USA. A species may thrive because its natural enemies don’t exist in the habitat it has arrived into. It may be adept at colonising a disturbed area, or quickly take over the fresh dirt turned up at a construction site, or a roadside. Some species sit around innocuously for years, only to then unleash themselves upon the ecosystem. The rogue Lantana camara exudes poisons through its roots, killing off its competitors. It also uses the colours of its flower petals — yellow and red — to advantage. As Uma Shanker, professor at the University of Agricultural sciences, Bangalore, explains, “Butterflies have a very high fidelity in moving from one flower type to the other. A butterfly visiting a red flower may not visit a yellow flower, but would only visit another red flower. Adapting to avoid this phenomenon, different lineages of Lantana have evolved.” Other invasives go piggybacking. In the eastern US, non-native variety of fish aid bullfrog invasion by eating native dragonfly nymphs that would normally prey on bullfrog larvae. Indeed, evidence of such “aiding and abetting” between two nonnative vertebrates is conclusive, according to a US Geological Survey study published in the journal Ecology Letters. “Gauging the potential invasiveness of species is usually based upon comparing geographic origin, climatic and latitudinal ranges, taxonomic relations, past invasive performances, and assessing their reproductive biology and general ecology. But [such studies] are often erroneous because we do not appreciate the role of mutual interactions between species,” says Uma Shanker. Shanker’s colleague K N Ganeshaiah has recently completed a study to predict the movement of the deadly woolly aphid (see box: Wanted: more predictive research). Sucessful invasion depends not only on the traits species have, but also on how susceptible the habitat is. Generally, islands face the highest risk. “Three generally accepted models to understand this susceptibility have emerged — the fluctuating resource availability model, the enemy release hypothesis and Niche opportunity model,” points out Babu. The first proposes that invasiveness depends on excess resources (energy) being available to be consumed. Such availability fluctuates over time; so, therefore, does a habitat’s vulnerability to invasion. The enemy release hypothesis suggests that when a plant species is introduced to an alien habitat, herbivores and other natural enemies pay it a little less attention. So it is able to literally bloom. This hypothesis is predicated on three principles: natural enemies are important regulators of populations; they impact native species more than exotics; and plants capitalise on less regulation by the enemy. Lastly, the Niche opportunity model defines conditions that promote invasions: interactions between resources, natural enemies and the physical environment, and how these vary in time and space. Whatever the path, an invasive plant invariably alters the habitat, affecting its health. It draws in more nutrients and moisture, so out-competing native species. It paves the way for further invasions by microorganisms, agricultural pests and human pathogens. The worst cases result in large-scale environmental transformation. Chemicals released from their roots or leaf litter may change the soil’s chemistry; the chemical nature and decomposition rate of the leaf litter and other dead parts may alter the habitat’s nutrient cycle. “Invasion by fast-growing tree species in catchments as well as aquatic weeds in water bodies drastically reduce the flow of streams and rivers, as in the case of water hyacinth which has infested water bodies in Assam alone,” says R Ramani, senior scientist, Directorate of Biological Control, Bangalore. Animals can be as incapacitating. The zebra mussel is today considered one of the worst aquatic invaders in the US. Originally found in Russia, it came to the US floating in the ballast water of a transatlantic freighter. In less than 10 years, it has spread to over 100 lakes. Able to live and feed in different aquatic habitats, this mussel is a prolific breeder (each female produces one million eggs per year). Its larva is the size of the diameter of a human hair, and so can spread easily via water currents. Adult zebra mussels are larger than two inches in length, and attach themselves to hard objects. They often stick to boats, and so travel from one water body to another, clogging municipal, industrial and power plant water supply systems, damaging boat engines and fouling boat hulls, killing native molluscs and eliminating fish spawning beds. Damage by invasives is both ecological and economic. It’s a challenge the world is waking up to, slowly. Last year, a cricketing row broke out between New Zealand and India, when a member of the Indian team was fined for carrying soiled shoes. For India, it was cricketing pride at stake. But New Zealand customs authorities were merely following quarantine regulations. The shoes could have carried a possible invasive. For such species, the cliché — prevention is better than cure — works. It’s something countries like Australia, New Zealand and the US have learnt after bitter experiences. They now accept that intercepting potential invasives is the key to a more cost-effective and efficient way of controlling these noxious invaders. India, on the other hand, has just taken off the starting line. It has only recently updated its rules to monitor the import of seeds, plants and plant products for invasive pests and weeds — the Plant Quarantine (Regulation Of Import Into India) Order 2003. In this order, the government has also introduced a mandatory Pest Risk Analysis for any new product or an already imported product being sourced from a new country. The analysis tries to predict the possibility of a consignment carrying a potential pest or weed entering the country may of the product. “The depth to which the analysis is done depends upon how great the economic benefit is from the product,” explains Reddy.“For example import of pulses is necessary because India is not self-sufficient. So we right away make fumigation mandatory. But if you are importing strawberry, we shall conduct detailed analysis because many viruses, fungal pests, bacteria are involved.” Such analysis forms the bedrock of invasive detecting techniques in alert countries like New Zealand. But rules alone do not work. India’s quarantine workforce comprises a mere 200 technical staff, only 5 per cent of that in the US and about 7 per cent of the Chinese (a country which has very recently begun to secure its borders against invasive species). Reddy admits such a tiny team cannot monitor India’s large territorial and marine borders, and the airways. The laws, too, are lax. “We are not even allowed to monitor the discharge of ballast waters from ships, unlike in other countries,” he says. While it is aware of the threat, India does not guard its environment against invaders. Once established and naturalised, detection and prevention before the species becomes invasive is next to impossible. The only hope is to control contamination, or completely eliminate the threat. Options to curtail spread are limited. In the case of weeds, mechanical removal is the simplest way. But it rarely works. You can keep uprooting Lantana; it will come back. Even controlled fire does not work for many weeds. Indeed, the effect is often a fire-cleared field, now made ready for the invasive to take over. If the pest is not a small insect but a large mammal, the tactic is simple — shoot to kill off. Take the case of spotted deer, introduced to the Andaman Islands between 1915 and 1930. In the absence of a predator, their spread has been spectacular and debilitating, They have browsed the forest floors so rampantly that the ecosystem has changed. The undergrowth is missing and some tree species have stopped regenerating. “The changes could be irreversible even if the feral deer is now eliminated, studies conducted in other countries on the deer show,” says Rauf Ali, an ecologist with the Foundation for Ecological Research, Advocacy and Learning, Pondicherry. But India’s wildlife laws put the deer into schedule I — a list of animals most worth protecting. Ali and other ecologists have been begging the Indian government to allow the deer to be hunted, but the animal cannot be touched. There are two more complicated and sophisticated methods to uproot invasives — spraying chemicals or using biological control agents. The former is today a huge global industry; the latter is finding its feet in scientific labs. Most countries have accepted chemical spray in the case of agriculture to control weeds and pests today. Its indiscriminate use has had horrific health impacts. Pests and weeds have mutated and become more persistent. Biological control is touted as a less dangerous option. But it has not been successful in actual field conditions. The biological control idea is simple: find a predator of a pest or weed in its original habitat, and introduce it in the invaded region. But some tough parameters have to be met. The predator needs to be host-specific, for instance, and not predate on other plants or animals. In 1889, the Australian vedalia lady beetle was brought to California, USA, to control the cottonycushion scale insect threatening citrus orchids. The beetle completely eradicated the pest. In India, too, the introduction of Dactylopius opuntiae to control the prickly pear has been a great success (see: India: Bio-control). But ascertaining such host-specificity is difficult. Numerous examples exist of biocontrol agents themselves becoming pests. The most infamous one is that of the release of the predatory snail Euglandina rosea to control the alien African giant snail in the Hawaiian Islands. E rosea ate up most of the 41 indigenous snail species; the African giant snail still crawls over Hawaii’s forest floors. 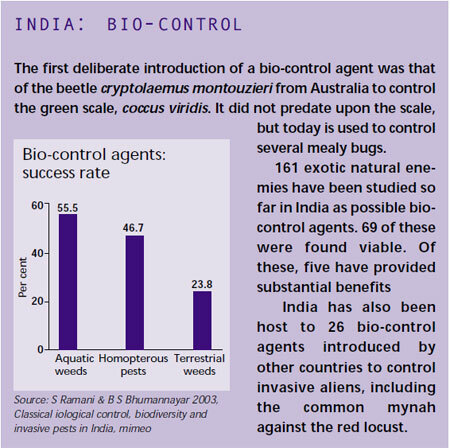 “India lacks the ability to monitor the release of biocontrol agents. We can experiment, but unless people are involved in the process of recovery and monitoring the real impact of a biocontrol agent in the heterogeneous environment of a tropical country like India, it is difficult for biological control to actually work,” says Reddy. India cannot replicate the governance and monitoring that developed countries like New Zealand and the US practice. The latter now has a federal umbrella agency to sniff out invasives, one empowered with a huge budget and stringent regulations. New Zealand, especially vulnerable because it is an island, has tight quarantine regulations and constant monitoring. “In countries like New Zealand and Australia an entire area can be sealed off if a contamination is reported,” explains S Ramani. India, heterogenous and complex, can hardly afford to take such measures. Thus prevention becomes paramount for this country, and therefore prediction methods, risk analyses and evaluations of potential invasives in tropical environments. But where are the taxonomists to do all this? 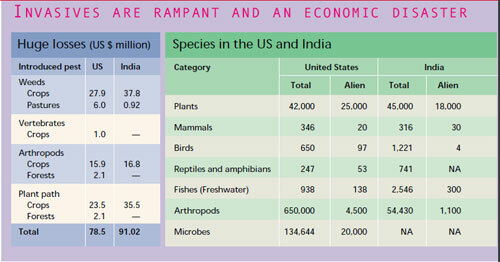 Where is the original research on invasive alien species in India? The scattered bits and pieces of research carried out in different universities and some government laboratories is neither focussed nor organized. India needs a central and easily accessible reservoir of data, a directed campaign that builds on existing knowledge and does not repeat itself. “We have to generate our own data,” says Shanker. The same pest or weed can act differently in different climes: New Zealand’s research priorities cannot be India’s, too. Also, India cannot ignore the option of seizing some invasions as opportunities. Lantana basket weavers, of the Korava community of Pudhuputi village in Tamil nadu’s Dindgul district, have been using at least five more weeds besides lantana for more than 60 recorded years. While science from the top can assist, it is finally the people suffering the impacts of invasives who can create a credible force to fight this kind of terrorism. India needs to arm its communities, and must do it yesterday. Even so, what makes for a successful invasion? Out of 250 species in the genus Mikania, how is Mikania micrantha capable of smothering new habitats? Imported and introduced, reportedly, in West Bengal in the early 20th century, it was initially used in Assam to cover airstrips during World War II. It then moved from there and now is the biggest threat to tea plantations, apart from badly affecting pineapple, banana, ginger, acacia and rubber plantations. How is it able to do so? Usually, if a species is present in small numbers, its breeding options are low. This genetic bottleneck might cause it to become extinct. But invasive species manage the bottleneck with flourish, and after establishment can explode in numbers. New research published in the journal Conservation Biology suggests a factor called propagule pressure might be crucial to "invasiveness": the number of individuals introduced, and the number of times a population is released into the new habitat. But how is a species able to outperform locally adapted, indigenous species? R M Callaway, in a paper published in the journal Science, provides some answers. First, some species may be intrinsically better competitors because they evolved in a more competitive environment. Second, the absence of enemies -- say, herbivores in the case of plants -- gives the non-indigenous species more resources to grow, reproduce and eventually out-compete native species. In this context, the case of the Chinese tallow tree (Sapium sebiferum) is extremely interesting: as it evolved in its introduced range, it began to show competitive ability far greater than it exhibited in its original habitat. Indeed, invasive species can create and manage brilliant strategems to beat the competition. When a pathogen's host is already there, as mosquitoes were for the West Nile virus, it can tip the odds in favour of the invader, says Daniel Simberloff, professor at the University of Pennsylvania, USA. A species may thrive because its natural enemies don't exist in the habitat it has arrived into. It may be adept at colonising a disturbed area, or quickly take over the fresh dirt turned up at a construction site, or a roadside. Some species sit around innocuously for years, only to then unleash themselves upon the ecosystem. The rogue Lantana camara exudes poisons through its roots, killing off its competitors. It also uses the colours of its flower petals -- yellow and red -- to advantage. As Uma Shanker, professor at the University of Agricultural sciences, Bangalore, explains, "Butterflies have a very high fidelity in moving from one flower type to the other. A butterfly visiting a red flower may not visit a yellow flower, but would only visit another red flower. Adapting to avoid this phenomenon, different lineages of Lantana have evolved." Other invasives go piggybacking. In the eastern US, non-native variety of fish aid bullfrog invasion by eating native dragonfly nymphs that would normally prey on bullfrog larvae. Indeed, evidence of such "aiding and abetting" between two non-native vertebrates is conclusive, according to a US Geological Survey study published in the journal Ecology Letters. "Gauging the potential invasiveness of species is usually based upon comparing geographic origin, climatic and latitudinal ranges, taxonomic relations, past invasive performances, and assessing their reproductive biology and general ecology. But [such studies] are often erroneous because we do not appreciate the role of mutual interactions between species," says Uma Shanker. Shanker's colleague K N Ganeshaiah has recently completed a study to predict the movement of the deadly woolly aphid (see box on previous page: Wanted: more predictive research). Sucessful invasion depends not only on the traits species have, but also on how susceptible the habitat is. Generally, islands face the highest risk. "Three generally accepted models to understand this susceptibility have emerged -- the fluctuating resource availability model, the enemy release hypothesis and Niche opportunity model," points out Babu. The first proposes that invasiveness depends on excess resources (energy) being available to be consumed. Such availability fluctuates over time; so, therefore, does a habitat's vulnerability to invasion. The enemy release hypothesis suggests that when a plant species is introduced to an alien habitat, herbivores and other natural enemies pay it a little less attention. So it is able to literally bloom. This hypothesis is predicated on three principles: natural enemies are important regulators of populations; they impact native species more than exotics; and plants capitalise on less regulation by the enemy. Lastly, the Niche opportunity model defines conditions that promote invasions: interactions between resources, natural enemies and the physical environment, and how these vary in time and space. Whatever the path, an invasive plant invariably alters the habitat, affecting its health. It draws in more nutrients and moisture, so out-competing native species. It paves the way for further invasions by microorganisms, agricultural pests and human pathogens. The worst cases result in large-scale environmental transformation. Chemicals released from their roots or leaf litter may change the soil's chemistry; the chemical nature and decomposition rate of the leaf litter and other dead parts may alter the habitat's nutrient cycle. "Invasion by fast-growing tree species in catchments as well as aquatic weeds in water bodies drastically reduce the flow of streams and rivers, as in the case of water hyacinth which has infested water bodies in Assam alone," says R Ramani, senior scientist, Directorate of Biological Control, Bangalore. Animals can be as incapacitating. The zebra mussel is today considered one of the worst aquatic invaders in the US. Originally found in Russia, it came to the US floating in the ballast water of a transatlantic freighter. In less than 10 years, it has spread to over 100 lakes. Able to live and feed in different aquatic habitats, this mussel is a prolific breeder (each female produces one million eggs per year). Its larva is the size of the diameter of a human hair, and so can spread easily via water currents. Adult zebra mussels are larger than two inches in length, and attach themselves to hard objects. They often stick to boats, and so travel from one water body to another, clogging municipal, industrial and power plant water supply systems, damaging boat engines and fouling boat hulls, killing native molluscs and eliminating fish spawning beds. Damage by invasives is both ecological and economic. It's a challenge the world is waking up to, slowly. "Biological control is the way out"
What are the various methods of managing invasive weeds? The government generally comes to know about invasive weeds 10-15 years after they are introduced. By then, they are already spread over wide areas and their extinction becomes impossible. The only thing that can make a difference is the people's awareness. People should be informed as soon as a pest is intercepted by the quarantine department. In initial stages, a community approach with mechanical controlling methods - such as uprooting - is enough to overcome the probldem. Earlier, we could burn these weeds; now a days, however, because of environmental reasons, we do not have that option anymore. We cannot use chemicals either, as in some cases they may harm other useful plants as well. Bio-control methods are the only way out, but they are risky as the controlling agent may turn into a pest in the future. Therefore, we have to be very careful. For instance, in case of parthenium, we looked for a specific biological controlling agent that eats only parthenium and had to make sure it would not switch over to any other plant. We searched the parthenium's original habitat and some other countries where it is found, whose climate is similar to that of ours. Then we determine some useful biological controlling agents - insects, viruses, fungi - and import them. For this we have a protocol, which is different from that of the FAO. What are the steps processes of importing biological controlling agents? In India there is a nodal agency called the Project Directorate of Biological Control (PDBC), which is based in Bangalore. A scientist who wants to import a biological controlling agent has to first give all the information about the organism he wants to import - whether it is specific to a particular weed, and whether it can be multiplied in lab conditions. Biological controlling agents must be well tested. The organism should meet the ideal attributes of biological controlling agents. Their handling and release should also be hazard-free. For instance, scales and dust produced by certain insects can create health problems for us. All this information is to be submitted in a document to the PDBC, which then forwards the request to the Government of India. Then it goes to a committee generally headed by the chair of the ICAR, with a PPQ advisory representative as member secretary. After the committee's approval, the place from where the controlling agents are to be imported is decided and the import permit is given by the PPQ. After the import, the consignment is again checked by the PPQ, and handed over to the scientist, who then develops a protocol for its multiplication and release. The release is usually carried out in pocket conditions to make sure that no risk is involved. How successful have these biological controlling methods been? While searching for a controlling agent, we must keep in mind the fact that the climate of the country from which we are importing it should be similar to that of our own. Like in case of parthenium, Zycogramma Bicolorata, which is used as a controlling agents, was established successfully in Banglore, where climate is suitable for it. In the case of Delhi, however, it did not produce any good results due to the extreme temperatures in the city. What is the ecological history of parthenium? It is said that that parthenium came with a consignment of the wheat from Mexico. The parthenium seeds are also too small to intercept. The first report on parthenium came was from Pune. Initially, mechanical and chemical devices failed to get rid of the weed. What are the health problems associated with parthenium weed? Lots. It is harmful for people suffering from asthma. Its pollens cause pollenises. Some nervous disorders have also been reported. In forest areas, it causes dermatitis to rodents like rabbits. Why was zycogramma bicolorata used as a controlling agent? A good thing about zycogramma bicolorata is that it eats the parthenium weed only. It strikes at the plant's leaf, and the plant cannot survive without its leaf. There were a few reports that the insect was devouring sunflowers as well. After an inquiry by a government fact-finding committee, it was however found that the zycogramma bicolorata could not develop on sunflowers. Permission of its release was given. We released it in Delhi three years ago. What is the current status of its introduction? We have found mixed responses in north India. Now it is being introduced in some other parts of the country, like Karnataka, Madhya Pradesh, and in Jammu and Kashmir. Can it switch over to any other plant? After finishing parthenium, it can switch over to another plant, but the chances of its survival are low. Insect multiplication decreases according to the availability of food. Thus multiplication of zycogramma will decrease as the population of parthenium decreases. "We need to be more proactive"
How easy is it to predict the potential of a plant to become invasive in a new habitat? 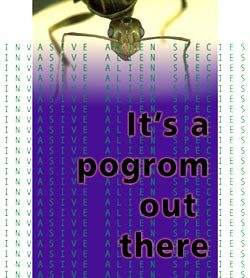 When an alien species, be it a pest or a weed gets into another habitat, there is generally a time lag before it becomes invasive. Its introduction, as such is sudden and people don't even realize that it has been introduced into a habitat. For example, in case of the parthenium hysterophorus, even realized that an alien species had entered the country. At that time, in the early 1950s, India was going through a big famine and was importing wheat, which contained parthenium seeds. The weed was first sighted in Pune in 1955 and after that it began spreading. Looking at the history, one will notice that the weed spread virtually along the railway tracks because the wheat was being transported by rail. The same thing happened on the roadways. Soon, it spreads beyond control. Then the best thing to do is understand the kind of situation the weed thrives in its place of origin and do a GPS mapping of the habitat and its likely spread. Other data sources such as climexa programme that uses climatological information from throughout the world, can also be used. In my opinion, we require both biological and climatological information, including maybe even physiographic data, and then predict the areas where these species are likely to become pests. This has generally not been done in India except once, for predicting the occurrence of the sugarcane woolly aphid when the genetic algorithm and the GIS were used. They were able to predict the kind of areas that the aphid is likely to become a pest. The thing with invasive species is that it is best for you to look for natural enemies from the country of origin of the pest or the invasive weed. So when we start looking for the natural enemy in the country of origin, we need to see whether that natural enemy will do well in our own environment. Which weeds and invasives in India would you find the most difficult to handle? 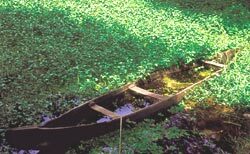 The worst weeds would be the siam weed (Chromolaena odorata) lantana (Lantana camera) water hyacinth (Eichhormia crassipes) water fern (Salvinia molesta) parthenium (Parthenium hysterophorus) and mile-a-minute (Mikania micrantha). Would the impact of invasive species on complex ecosystems be very different from those in monocultures, such as plantations? There will be a difference. Several other biological entities, such as other weeds and indigenous plants are already thriving in a complex eco-system. When the invasives take over, they have the tendency to displace the indigenous plants or pests. When that happens, the effect is much more pronounced in a complex eco-system. There could be a large-scale displacement of indigenous plants. Sometimes this could be beneficial. But more often than not, it is harmful because once the indigenous species are gone, the entire ecosystem is upset. In a monoculture situationan invasive plant is also likely to displace the indigenous weeds that are already there. So whether in a monoculture or a complex ecosystem, the difference is not much. But the difference will be more pronounced in a complex ecosystem because of the landslide effect. Which of the three general models of invasions - the fluctuating resource availability modeland enemy release hypothesis and the niche opportunity model - would explain the principles of invasion best? In the niche opportunity modelan invasive tries to occupy either a vacant area or displaces several other species. I would say this model is the best. In the enemy release hypothesis, for instance in a crop situationa person looking for good traits in a crop goes to its centre of origin. With rice, for instance, the centre of origin is south-east Asia, where one will find numerous variants. In the natural enemy modea balance has been set up between the pest or weed and its natural enemies, which have co-evolved over a period allowing both to thrive. This balance helps the natural enemy have a upper hand over the weed or pest. One can identify this natural enemy and introduce it in a new area to set up a similar balance. This works if the climactic conditions are suitable. Have any such introductions been made in India? Yes, a lot of introductions have happened in India with weeds and pests. One of the earliest was in 1898 when the Australian ladybird beetle was introduced by a planter in the Palanis to control a citrus pest. There are a lot of commercial insectories producing natural enemies in large numbers. It is being used for the control of mealy bugs, which is a pest in grape plantations. Can India have a specialised and central group of experts for research and management of invasives as in the US? Is it practicable for India to implement strict quarantine rules like New Zealand does? In the US, virtually every state has its own independent way of looking at pests. They have strict quarantine regulations there. Quite often, if you land in the US with a plant material, it is burnt. But despite all this, maximum invasion is takes place in areas like Florida because of its huge tourist inflow. Australia is one good example of quarantine functions. The Australian Quarantine Inspection Service keeps track of what is happening in and around Australia, as in Papua New Guinea, New Zealand and the surrounding islands. Recently on a trip to New Zealand, Indian cricketer Harbhajan Singh was asked to throw away his shoes as it contained a lot of soil, which may have contained invasives. In India, all international airports have a quarantine inspector, but they are never present. Invasions are very difficult to control. The coffee berry borer pest came to India in 1991 not because of lack of quarantine but due to a humanitarian crisis. This was basically the crisis, which happened in Sri Lanka. This pest could be found in almost all coffee-growing countries, except India, at that time. During the troubles in Sri Lanka, however, Tamil migrants, especially plantation workers, coming in boatloads to India brought the pest with them. The Siam weed, for instance, came during World War II from Indonesia and Burma, through Assam right down to the south of India. Today it is found all through the Western Ghats, where it is fast replacing the lantana. During the war, when soldiers came from Assam towards Kerala, brought the weed. The mile-a-minute weed grows 20-30 cm a day and most of these weeds are South American in origin. This particular weed was used in Assam during World War II to quickly cover and hide runways. Today it has spread and is a major problem in the tea gardens in Assam as well as in the Western Ghats in Kerala. In the past 14-15 years, India has had at least five or six invasions. With globalisation, it is now even more to control what pests are coming in and going out. Australia has a very good method. When parthenium hysterophorus, which is a serious problem in India, was cited in Western Australia and Queensland, the authorities put a strong check on traffic and cattle movement in the ranches of Western Australia. They set up several check points where they would stop vehicles and wash the under-chassis. In India we could have a very good quarantine system that should be linked with others who are working on invasive weeds or pests. There is, in fact, a regulation guided by the FAO where carries out pest-risk analysis for any import of biological organisms. Every country that wants to export material to India has to make this document of pest risk analysis. Today, with a lot of genetically modified (GM) organisms coming inthe checking is also done by the National Bureau of Plant Genetic Resources. How should the systematic study of invasive species continue in India? Should the money be put in research or in management? In both. One needs to be proactive and understand the invasives. One should know what plants are coming into a country and the ones hat are likely to carry pests. We should have a list of those invasives that are endemic and those that are likely to come into our country. So far, we have not been so proactive, but we do have list of pests that are likely to come in from other parts of the world and the quarantine officers check for the presence of these pests. However, sometimes we fail to implement the rules because of the volume of traffic. There is a need to link all the universities, research organizations and the plant quarantine storage department. Most often, one organisation does not know what the other is doing. This problem could be solved only if all organisations sat together. Several pests and invasives have been quite common. The water hyacinth which, for instance, is a common invasive weed found throughout the world. So a lot of research has been made on it. We can use that knowledge. You mentioned that 69 bio-control agents have been established, leading to recovery. How exactly would you define recovery? One-thirty-three agents were introduced, of which at least 69 agents have resulted in recovery. This is not a situation where we are talking about success, just recovery, even if in small numbers. We have very little data on the situation before and after the introduction of the agent. If the pests' natural enemies that are introduced are able to successfully parasitise the pest, we say recovery has taken place. Whether we get a good percentage of parasitism or whether it has really been able to bring down the population of the pest that is not really looked at. Are the introduced agents usually animals, or is it possible to introduce plants with allelopathic effects to counter other weeds? We generally introduce insects. There is a strong co-evolution between the pest and the plant. For example, if you take a weed control agent, this strong co-evolution has established that balance and so we try to introduce that particular natural enemy so the balance is established. Introducing a plant with allelopathic effect would be counter-productive because if we introduce a plant which is likely to displace this plantthe new one is again going to become a weed. For example in India we are talking about introducing a leguminous plant called cassia to displace parthenium. It is an indigenous plant and has an allelopathic effect, which means it is able to displace other plants. Once you have a biological organism you really have no control over it. So it is very important to first study the possible consequences and only then go in for field releases. There is a system which is known as the centrifugal method, by which we keep making circles beyond the close relative of a particular plant and keep testing all the host plants in that circle and make sure that even the closest relative of that particular plant is not affected by the agent we are introducing. After doing this battery of tests, we test them in a no-choice situation as well as a choice situation, and make sure that the agent does not feed or breed on any other plant other than the plant against which it has been targeted. Only then do we introduce that agent. There have been some exceptions. When we introduced the Mexican beetle against parthenium, it was able to bring down the parthenium population to some extent. But unfortunately, parthenium is a close relative of the sunflower and once the beetle population exploded and all the parthenium was destroyed, the beetles started feeding on sunflower. Later of course it was proved that this beetle was not able to complete its lifecycle on sunflower. There are some risks in biological control. We haven't had a very good control over the weed. Generally what happens is, if we are controlling a particular weed, such as parthenium, we need to target the reproductive parts. For example, in Australia, 16 agents have been introduced against parthenium, while we have introduced only one. Since we had a problem with the Mexican beetles feeding on sunflowers, if we apply for a permit to bring in an agent for parthenium, it will probably get rejected. But in the case of Australia they have gone about bringing in 16 agents to control the weed. They have not had a very good success but they still have been able to check its spread. What are the agents that have been introduced successfully in India? The Australian ladybird beetle has given substantial benefits and is today being commercially produced by several insectories. At least three agents have been introduced for water hyacinth. 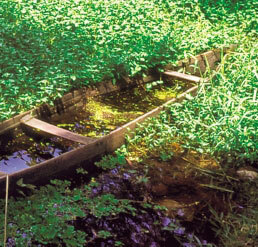 But one of the most phenomenal successes as far as weed control is concerned is the water fern. In the canals of Kerala, a particular weevil has been able to keep the water fern under check. It is estimated that up to around Rs. 68 lakh have been saved in one year in Kerala because of the introduction of this weevil. Has the Indian government given too much stress on pesticides? Has the trend changed perceptibly in the last few decades? Of course, in India at least, we have to be largely dependent on pesticides. I don't think we can do away with pesticides because we don't have any alternatives in place. Pesticide production and usage can be slowly reduced but today we don't have a mechanism. For example, in the US you can buy some of these bio-control agents across the counter, sometimes even in supermarkets. We don't have viable mass production methodologies. Of course, today the emphasis has shifted from pesticides to botanical and bio-control agents and the integrated pest control strategy (IPM) emphasizes on a mixture of methods in an economical fashion. Some problems only have pesticide solutions, you have no other alternatives. Methods like bio-control are slow and don't produce dramatic results. The farmer is not easily convinced.